This is the link to our demographic/attitude survey for 2013-2014. We’ll take a few minutes to fill it out at our first meeting of the year, Monday October 21, at 6:00 pm. Hope to see you there! Our next meeting is TOMORROW, Saturday March 2 at 9 am. We will hear about “hypercomplex numbers”. If you like complex numbers, you’ll love hypercomplex numbers! Last time, we had a very good session led by Dr. Hui Ma, on counting with different number bases. See her slides and problem set below. Share your solutions and questions here, or bring them to tomorrow’s session. See you there! Last time (at our Monday evening meeting), we talked about graph coloring problems. This idea has applications to coloring maps, scheduling problems, and lots of other things. Dr. Swenson’s presentation and problem set appear below. Note: there are many unsolved problems in this area. If you go to the last page of the presentation, there is a link to a list of unsolved problems that people are interested in. Our next meeting is Saturday, Feb 23, at 9:00 am (the regular time). See you then! We had a good meeting last time. Dr. Nag described some ideas from probability, and then we worked on some problems. We saw quite a number of different applications, from playing poker to comparing birthdays to matching socks! Dr. Nag’s problem set is below (.pdf format). See you! Saturday Jan 12 meeting CANCELED! Hope to see all of you on Saturday January 26. Thanks! Hope to see you again this Saturday, when Dr. Stone will be leading a session on careers in mathematics. Due to technical difficulties in our usual room, we will plan to meet in Jonas 202 instead (where we ended up last time). 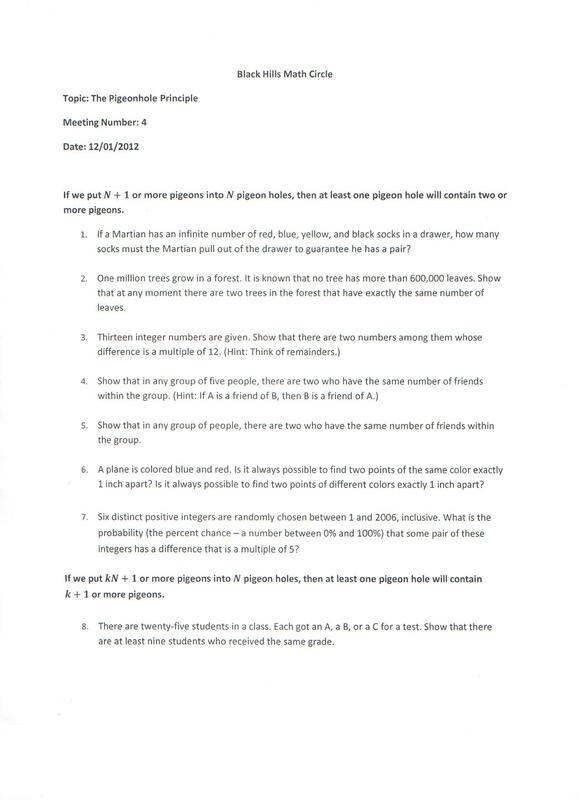 Also, I’m attaching our problem set from last time (on the Pigeonhole Principle). Take a look, and feel free to attach any comments here on the blog! Just wanted to remind you all that our next meeting is this Saturday, Dec 1 (9:00). We are pleased to welcome Ms. Kristel Ehrhardt, who will be talking to us about the Pigeonhole Principle. See you there!